Hernandaria scabricula, copyright Abel Pérez González. 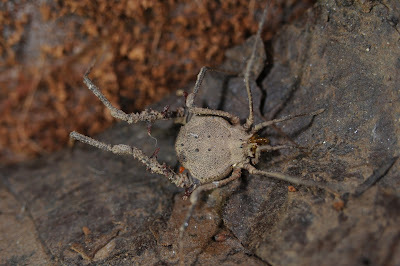 The Hernandariinae are a group of densely granulate gonyleptid harvestmen, often carrying a coating of dirt as camouflage. Characters (from DaSilva & Kury 2007): Dense granulation on whole body, camouflage of dirt, strong apophyses on anterior margin of dorsal scute, single opening of scent glands. Sexual dimorphism of leg IV present or absent. Sexual dimorphism of basitarsus I present or absent. Mesotergum with 3 or 4 areas separated by transverse grooves. [DK07] DaSilva, M. B., & A. B. Kury. 2007. A remarkable new species of Multumbo showing sexual dimorphism, with the transfer of Multumbo and Piassagera to the Hernandariinae (Opiliones, Gonyleptidae). Zootaxa 1558: 29–37. [FP-R02] Firmo, C. L., & R. Pinto-da-Rocha. 2002. A new species of Pseudotrogulus Roewer and assignment of the genus to the Hernandariinae (Opiliones, Gonyleptidae). Journal of Arachnology 30: 173–176. [V05] Vasconcelos, E. G. 2005. Notes on Geraecormobius clavifemur (Mello-Leitao, 1927) and description of Geraecormobius reitzi n. sp. (Arachnida: Opiliones: Gonyleptidae). Zootaxa 1088: 1–10.